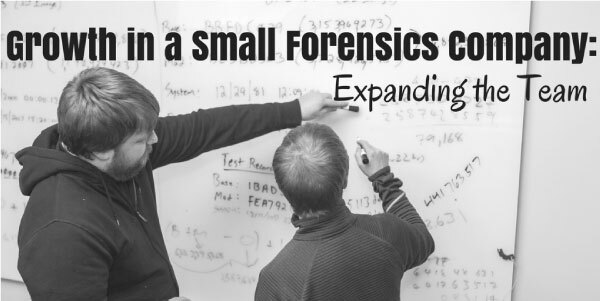 Growth in a Small Forensics Company – Expanding the Team - DME Forensics Inc.
Not long after DVR Examiner was released in June of 2014, we saw the need to expand the team. Our next addition to the team was a support technician to help answer technical questions from users, as well as test DVRs that were to be implemented into DVR Examiner. Not long after, we added an office administrator to assist in the day-to-day quoting, invoicing, and other non-technical tasks. In a young start-up, adding employees increases the pressure to perform. When starting a company, you do so while fully acknowledging the risk you are taking in leaving a steady career. When additional employees are involved, if the company doesn’t succeed, it isn’t just YOUR livelihood that is at stake. While I had confidence in the company and DVR Examiner as a product, it was still very early, and it can take a long time to reach a point of stability. At the time, I don’t think I truly realized how stressful this time would be. The old saying is “it’s just business, nothing personal”, but that is easier said than done when you hire a few people who are taking a risk to join a young company. If you don’t deliver, the company doesn’t succeed, and then you need to have difficult conversations with people that were counting on you. It’s hard to say that doesn’t become personal at some level. It took about a year of DVR Examiner being available before I slept a little easier at night. We were hearing positive feedback and people were renewing their licenses. We couldn’t (and wouldn’t) rest on our laurels, but it was a great relief that people were excited about the product and future. Even today, we’re still conservative on how we grow the team because we want the company to succeed and continue to be able to offer innovative solutions to the forensic community.